Sean Brittain has used some of the world’s most powerful telescopes to study the chaos swirling around a young star about 335 light years from Earth. Huge chunks of rock are slamming together to form what could be the first planets of a budding solar system. Back home in Clemson, Brittain deals with a different kind of chaos each Tuesday and Thursday night during soccer season. He coaches a team of youths, ages 7-9. “We’re working on passing the ball,” the father of three said with an easygoing smile. Brittain’s feet are on Earth, but his eyes are often on the night sky. He led an international team of scientists that discovered evidence strongly suggesting a planet is orbiting a star known as HD100546. The team reported its findings in The Astrophysical Journal. News outlets around the globe covered the discovery in at least four different languages. The planet would be at least three times the size of Jupiter, so there would be plenty of real estate. But if you’re looking to relocate, don’t book your ticket on the USS Enterprise just yet. The planet would be an uninhabitable gas giant. And even if you traveled at the speed of light, it would take more than four lifetimes to get there. Astronomers are interested in the solar system for a different reason. The work that Brittain’s team did built on previous research by a team that found a collapsing blob of gas and dust could condense into a planet in about one million years. That means astronomers believe they have found not one but two “candidate planets” orbiting HD100546. Taken together, the findings could mark the first time astronomers have been able to directly observe multiple planets forming in sequence. It’s something astronomers have long believed happens but have never been able to see. Other solar systems that astronomers have observed are either fully developed or too far away to see in the kind of detail that HD100546 offers. “This system is very close to Earth, relative to other disk systems,” Brittain said. “We’re able to study it at a level of detail that you can’t do with more distant stars. This is the first system where we’ve been able to do this. As an astrophysicist, Brittain could be working just about any time of the day or night. It sometimes means staying up all night to observe the stars and then pushing through to teach class. In one recent all-nighter, Brittain logged on to a video conferencing website to work with two collaborators, one in Tucson and one in Berkeley. The telescope they used was at the W.M. Keck Observatory in Hawaii. The patchwork of faces on his screen looked like something out of “Star Trek,” Brittain said. The team worked from 11 p.m. to 11 a.m. Clemson time, and then Brittain headed for the classroom. Brittain has the opportunity to observe the stars about four times a year. He collaborates with researchers all over the world, so conferences calls can be early in the morning. “There’s no time of day when it’s 9-to-5 for everybody,” he said. Brittain made three trips to Chile as far back as 2006 to gather data for the research he did on HD100546. He used telescopes at the Gemini Observatory and the European Southern Observatory. Northern Chile is one of a few places in the world just right for high-powered telescopes, Brittain said. The weather is predictable, the skies are usually clear and the political climate is stable. Each time Brittain went to Chile, he flew from Atlanta to Santiago, where he would spend the night. Then he would take another flight to Antofagasta, where he would catch a two-hour ride to the observatory. The city quickly gave way to a desert landscape, he said. Brittain grew up watching “Star Wars,” but he isn’t a serious sci-fi fan. And he wasn’t the kind of kid who grew up gazing at the stars through a telescope in his backyard every night. Brittain fell into astronomy after receiving his bachelor of science in chemical physics from LeTourneau University in Texas. He headed to Notre Dame to study the foundations of quantum mechanics but found that the adviser he wanted was retiring and not accepting new graduate students. Brittain soon found another professor who was doing research into the organic chemistry of comets. It seemed to be a fit considering Brittain’s chemistry background. Even better, the professor did some of his research at the W.M. Keck Observatory in Hawaii. “Here I am in South Bend, Indiana, where it’s cold and gray, and here was an opportunity to go to Hawaii,” Brittain said. Brittain has spun the opportunity into a successful career. He received his Ph.D. in 2004 and became a NASA-funded Michelson postdoctoral fellow at the National Optical Astronomy Observatory. Brittain came to Clemson two years later with his wife, Beth, and their children, Olivia and Sam. They have since added a third child, Charlotte. Brittain’s chemistry background helped get him an early start on using high-resolution spectroscopy to study the formation of stars and planets. It was a relatively new technique early in his career, he said, and has played a major role in his research on HD100546. The technique enabled the team to measure small changes in the position of the carbon monoxide emission. A source of excess carbon monoxide emission was detected that appears to vary in position and velocity. The varying position and velocity are consistent with orbital motion around the star. The favored hypothesis is that emission comes from a circumplanetary disk of gas orbiting a giant planet, Brittain said. 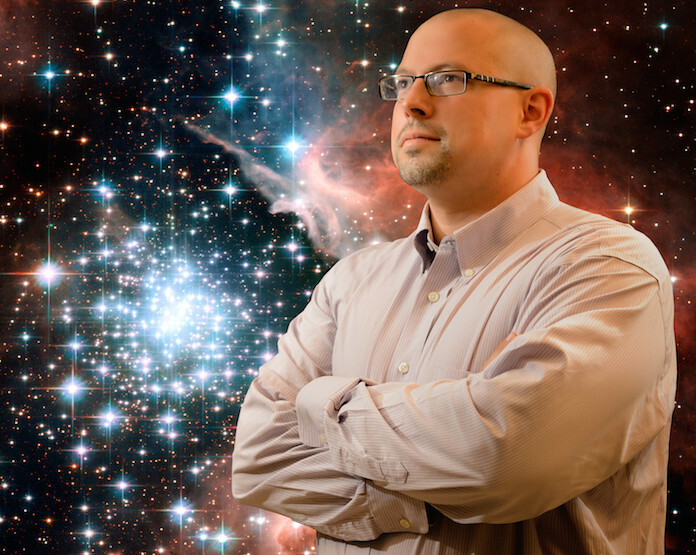 Brittain served as lead author on The Astrophysical Journal article. Co-authors were John S. Carr of the Naval Research Laboratory in Washington, D.C.; Joan R. Najita of the National Optical Astronomy Observatory in Tucson, Arizona; and Sascha P. Quanz and Michael R. Meyer, both of ETH Zurich Institute for Astronomy. “I congratulate Dr. Brittain and his team on their excellent work,” Leising said. “Astronomers are now very good at finding already formed planets around many nearby stars, but it has been difficult to watch the planets in the process of forming. Brittain said he is looking forward to observing the solar system using more advanced telescopes, including the James Webb Space Telescope scheduled for launch in 2018 and the 30-meter telescopes that could be ready as early as 2022. If there’s any similarity between Brittain’s research in space and his coaching on Earth, it’s that both take teamwork to be successful, he said. “No one is the boss, but every-one is working toward a common goal,” Brittain said.